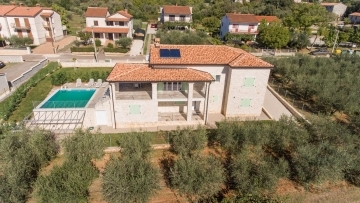 A beautiful villa near Vizinada, only 10 km from the sea and the beaches. It is 180 m2 in size and has a large garden of 7,000 m2. On the ground floor there is a large living room with a wood burning fireplace, kitchen, dining room and large storage room, boiler room and one bedroom. On the first floor there are two bedrooms, each with its own bathroom. The villa has two terraces with a beautiful view of nature. In the yard there is a swimming pool with plenty of sunbathing area, a summer kitchen with a barbecue and a children's playground. The villa is equipped with top quality furnishings.